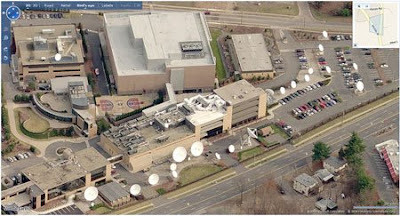 Today’s Live Search Maps bird’s eye view of antenna farms takes us to ESPN in Bristol, CT. This antenna farm is a mile and one half from my house and is the biggest antenna farm in this part of the country. I count 31 dishes and I may have missed a few (I could not get all the dishes in the above image).